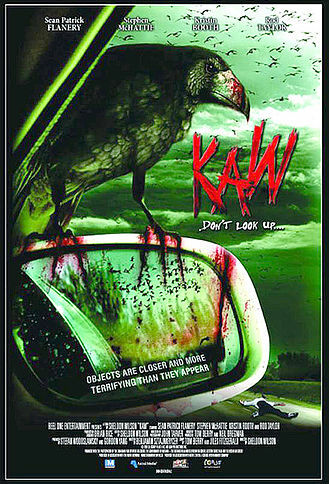 Tag line: "Don't Look Up"
A 2007 horror / thriller about a small Pennsylvania community at the mercy of some pissed-off ravens, Kaw has its moments of unintentional hilarity, but even if it did make me laugh at the wrong times, I never once wanted to switch the movie off. Evermore, PA is a quaint little town. So little, in fact, that Sheriff Wayne (Sean Patrick Flanery, one half of The Boondock Saints) has no choice but to pack up his things and take his new bride Cynthia (Kristin Booth) to the big city, where her talents as a cultural anthropologist may prove useful (as he points out, there isn't much call for her profession in a community of only a few hundred people). The day before they’re set to leave, however, all hell breaks loose in Evermore, pitting the outgoing sheriff against hundreds, maybe thousands of bloodthirsty ravens. They’ve already killed one person (a farmer who's only mistake was trying to start up his tractor), and attacked another: school bus driver (and former town drunk), Clyde (Stephen McHattie). But this was just the beginning; before long, all of Evermore is being ransacked by these winged killers, whose aggressive behavior is as mysterious as it is deadly. Borrowing a page from Alfred Hitchcock’s The Birds, Kaw features a number of bird attack scenes, some of which are well-executed (the sequence early on where the ravens try to take out Clyde has a few harrowing moments), while others are just plain goofy (not content with slamming into the windows, the ravens get a bit “creative” at one point when storming Clyde’s bus, which broke down on its way back from a girls basketball tournament). As for the ravens, they’re occasionally creepy, but, for the most part, are done in by shoddy CGI (the nighttime shots of them flying, silhouetted against the moon, looked absolutely cartoonish). Even more bizarre is the scene where we discover why the birds went ballistic in the first place (turns out a local Mennonite family knew more than they were letting on). Which, of course, leads to what might be the biggest issue I had with Kaw: it gives the ravens a motive. In The Birds, Hitchcock wisely avoided any explanations as to why his feathered assassins were attacking, which heightened the tension. By filling us in on the particulars, Kaw actually undermines the effectiveness of its central creatures (we sympathize with the ravens after learning what happened to them). On the plus side, Kaw has a strong cast (Flanery does a good job as the sheriff, yet the best performance is delivered by the always reliable Stephen McHattie, and keep an eye out for Rod Taylor, star of 1963’s The Birds, who has a small role as Evermore’s resident physician), and the story moves along at a solid pace (I was never bored watching it). In the end, I’m not sure these positives outweigh the film’s negatives, but hey… at least it wasn’t a total fiasco! For me, this entire movie was unintentionally hilarious. It sits squarely in so bad it's awesome territory. And I'm pretty that naming their town Evermore made Poe roll over in his grave.